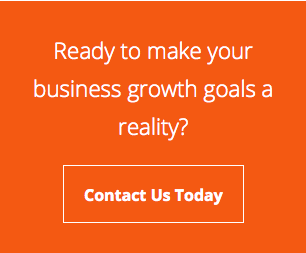 Add EMAG to your IMTS show planner HERE. FARMINGTON HILLS, MI – At IMTS 2014, EMAG will feature Manufacturing Systems for Precision Metal Components with multiple machines from its new modular standard VL and VT product families on display. These Modular Standard Machines offer a systematic approach that is advantageous to establishing a highly efficient manufacturing process, with different operations offered on the same platform allowing for easy interlinking and eliminating any great outlay for automation. The VL 2 Vertical Turning Machine from EMAG is designed for the quality- and cost-conscious manufacturer and sub-supplier: a universal production aid that impresses with its small footprint and advantageous price-performance ratio – automatic workhandling included. The VL vertical pick-up lathe series opens up new opportunities for the machining of a wide range of chucked components. Small gearwheels, planetary gears, sun gears, sliding sleeves synchronizer rings or flange components, for example, can be machined with great efficiency. The smallest lathe of the VL product family, the VL 2, machines workpieces with a maximum diameter of four inches and a length of up to six inches. Increasing in size, the VL 4, VL 6 and VL 8 offer a number of different turning and milling operations within the framework of a single closed-loop production process. Specially designed for the handling of large components the largest vertical turning machine of the series, the VL 8, ideal for commercial vehicle production, handles workpieces up to 16 inches in diameter and 12 inches in length. 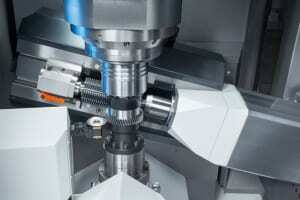 Built within the same modular concept is the VT-Series for machining large quantities of shaft components. With four axes, a self-loading turret and integrated automation, the VT 2-4 machines shafts with a max diameter of 2.5 inches and 16 inches in length. Spindle speeds of up to 6,000 rpm achieve extremely short cycle times as the shaft is clamped vertically between workspindle and tailstock and machined from two sides. The vertical alignment of the workpiece ensures process integrity, where the unhindered chip flow prevents the build-up of chip nests in the machining area. Machining area of the VL 2: 12 turning or, alternatively, up to 12 driven drilling and milling tools can be employed to carry out a large number of operations in a single setup. The machine can also be equipped with an optional Y-axis. A pick-up spindle/turret loads the machine itself, picking up the raw parts from the integrated conveyor and returning the finish machined component. A 12-station tool turret known for very short indexing times. 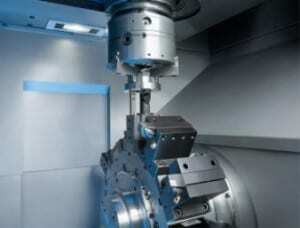 For drilling and milling operations it can also be equipped with driven tools in all 12 stations. Service units that are quickly and freely accessible, making for short set-up and change-over times. A machine base out of MINERALIT® polymer concrete to ensure stability through outstanding damping qualities, resulting in exceptional surface finishes. The VLC 200 H is designed for the machining of gear-type workpieces of maximum 200 mm diameter and module 4. Integrating the technologies of the EMAG Group into these new modular standards, the VLC 200 H will make its North American debut at the McCormick Center. 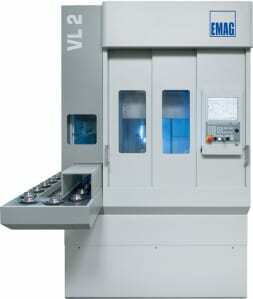 The VLC 200 H hobbing machine integrates EMAG-KOEPFER technology into the EMAG vertical platform, including the pick-up design where the main spindle removes the raw part from the conveyor belt, transfers it to the tailstock flange and removes it from the machining area after the completion of the hobbing cycle. 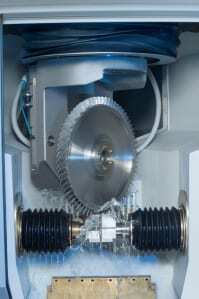 Gears with a maximum diameter of 8 inches and module 4 can be dry-milled at greatly shortened cycle times. Machining area of an EMAG PO 900 BF for the machining of blisks using Precise Electro-Chemical Machining (PECM) technology. EMAG will also present its entire portfolio of production technologies, from turning, hobbing and grinding to those that complement traditional metalworking processes, such as its production Laser Welding, Heat Shrink Technology and Electro-Chemical Machining (ECM) capabilities. ECM processes offer non-contact machining with no heat affected zone or mechanical stress to components with no tool wear. An ECM machined blisk will also be on display.